UDM Downloads > Sib Image Viewer! As the number of images that we download from the Internet, our digital cameras, phones and other sources grows steadily, we start feeling the need for a lightweight, easy-to-use and functional image viewer. Unfortunately, recent trends made many of the formerly popular applications too cumbersome and overloaded with features that most users are not likely to use at all. If you are seeking a compact, reliable and easy-to-use image viewing tool, stop your searches and take a closer look at Sib Image Viewer. Sib Image Viewer gives you everything you need for your daily image viewing tasks. You can browse images in the thumbnail mode, view images in the full-screen mode, show sequences of images as a slide show, attach descriptions to files for easier navigation, view image properties and perform a number of shell operations, such as copying, moving, duplicating and renaming files. The program has an extremely intuitive interface that will never puzzle you: all controls are arranged in a way that allows you to access them in with a single mouse click. But Sib Image Viewer is not merely an image viewer, but an image conversion tools as well. With Sib Image Viewer you can convert your images to BMP, GIF, JPEG, TGA, PNG formats and Windows 7 icons. 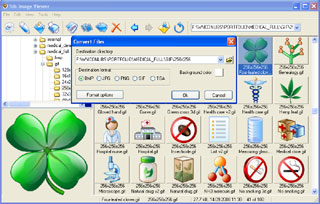 All these operations require minimal efforts from the user: just select a file or a set of files to be converted, right click on it and choose the corresponding command from the pop-up menu. All you need to do is to specify the destination folder and conversion options. The program will take care of the rest. Apart from these features, the program also offers a number of settings that come handy in various situations: for instance, icon generation options and full-screen captions that can help you find the necessary image in a folder full of hundreds of freshly taken digital pictures. Sib Image Viewer may well be the type of image viewer and converter that you have been after for so long. Don't miss this chance!